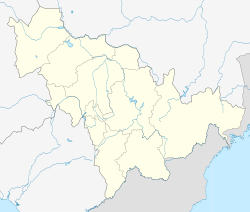 Yanji (Yeon-gil or Yenji in Korean, formerly romanized as Yenki) is a county-level city in the east of China's Jilin Province, and is the seat of the Yanbian Korean Autonomous Prefecture. Its population is approximately 400,000 of which a large portion is ethnic Korean. Yanji is a busy hub of transport and trade between China and North Korea. Yanji and its environs were largely unpopulated until the 1800s when Qing dynasty rulers of China began to encourage migration there from China proper as part of its Chuang Guandong policy to populate Manchuria in an effort to stem encroaching Russian expansion. The city was the seat of Jiandao Province in the Japanese puppet state of Manchukuo from 1934 to 1943. In 1943, the city itself was renamed Jiandao (Chientao) and made a part of the Dongman Consolidated Province. Following World War II, the city (again called Yanji) was nominally part of a new Songjiang Province but with the communist seizure of power in 1949, Sonjiang's borders were changed and Yanji became part of Jilin Province. 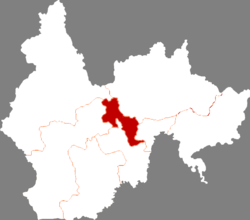 Yanji is now part of the Yanbian Korean Autonomous Prefecture, which is situated in eastern Jilin. Yanji City is centrally located, surrounded by five other county-level cities and two rural counties (see map); it is the administrative seat of the prefecture. The North Korean military detonated its second nuclear test in May 2009 close to the Chinese border, and the blast set off an earthquake of magnitude 4.5 with an epicenter only 112 mi (180 km) from Yanji. The mutual goodwill of the Chinese and Korean populations in the region was put under severe strain, and many in Yanji expressed newfound feelings of dismay and insecurity regarding their North Korean neighbors. A South Korean pastor, the Reverend Kim Dong-shik, was kidnapped in Yanji in January 2000, one of numerous well-publicized North Korean abductions of South Koreans: a suspect of mixed Korean-Chinese descent, said to have been trained in Pyongyang, was arrested and charged with the crime in December 2004. Yanji was the starting point of an international dispute in 2009 when two American journalists Euna Lee and Laura Ling were detained by North Korean border guards when, after leaving Yanji, they overstepped the nearby demarcation line. The two were freed only after intervention at the highest level, by former US President Clinton. Crystal meth seeping across the border from North Korea has led to a drug problem. According to a Brookings report, "Jilin Province is not only the most important transshipment point for drugs from North Korea into China, but has itself become one of the largest markets in China for amphetamine-type stimulants." Yanji had registered nearly 2100 drug addicts in 2010 compared to just 44 in 1990; local officials admitted that the actual number was possibly five or six times higher. Yanji is situated among foothills, with the main metropolitan area contained in a small, very flat area. It is ringed by mountains dotted with small, remote farming communities. It has a four-season, monsoon-influenced, humid continental climate (classified in the Köppen system as Dwb), with long, very cold winters, and short, but very warm, humid summers. Spring and autumn constitute very short transitions with some, but usually not heavy, rainfall. The monthly 24-hour average temperature ranges from −13.6 °C (7.5 °F) in January to 21.5 °C (70.7 °F) in July, while the annual mean is 5.40 °C (41.7 °F) and a total precipitation of 530 millimetres (20.9 in), most of it falling during the summer. Sunshine is generous but falling far short of the central and western parts of Jilin; with monthly percent possible sunshine ranging from 39% in July to 62% in February, there are 2,280 hours of bright sunshine annually. Yanji has six subdistricts and three towns. The Korean diaspora in China has significant populations in at least eleven major Chinese cities, but none larger than Yanji: official Chinese census reports from 1990 placed the city's ethnic Korean population at over 170,000. Official census reports from 2000 have not yet been released publicly, but current estimates place it between about one third of the city's total population to more than one half. Both Chinese and Korean are considered "official languages" of the city: all official signs are in bilingual text, with Korean at the top. With its current population estimated at four hundred thousand, Yanji is small by Chinese standards (by comparison, the population of Shanghai is almost twenty million). Yanji is also relatively young: the city was developed only in the nineteenth century and became the regional capital after the Second World War. Recent growth in tourism and overseas investment has helped to make Yanji a notably prosperous city. It abounds with modern architecture of steel and glass, and its broad avenues are conspicuously clean and well-maintained. In modern times, Yanji has become a city of transport and trade. China is the largest trading partner of North Korea, accounting for almost 40% of that country's international commerce, and Yanji is the center of much of the cross-border enterprise. Beyond North Korea, other countries have begun to partner with Yanji business groups: currently there are over five hundred joint ventures with international partners ongoing in Yanji. Much of the recent investment has been made by South Korea and Taiwan, which has helped substantially in building the city's tourism industry. Yanji also burnishes its reputation as a center of tourism by hosting the annual North China Travel Fair. Held every year since 1996, the fair is one of the largest of its kind in the country, showcasing over a thousand exhibitions representing cultural and economic partners from across China and overseas. Yanji also hosts the Tumen River Area International Investment & Business Forum, a three-day exposition held annually since 2000. Daily train service to most major urban centers of the province is available from Yanji, including a 24-hour trip to Beijing. A much shorter trip to the Chinese capital can be arranged at Yanji Chaoyangchuan Airport which serves the area with scheduled passenger flights domestically and to Korea. International air service is provided by the Changchun Longjia Airport, and surface travel to Changchun itself has been made more accessible since the large Changchun-Yanji Expressway was opened to the public in 2009. A new 125-mile (201 km) water and sewage pipeline was completed in 2006, linking Yanji and the neighboring cities of Jilin and Songyuan to modern sewage treatment plants along the Songhua River. As of 2012 Yanji offers the most convenient road access to the Rason Special Economic Zone in North Korea. Yanbian University is a comprehensive university in Yanji, founded in 1949; it offers eleven programs of study, including four doctoral programs. The university maintains a full-time teaching staff of over 1,400, serving an active student body of over sixteen thousand. One of Yanbian University's graduates, a Korean language major, is Zhang Dejiang, formerly a deputy secretary of the Municipal Committee of Yanji (1983–1985), and now a Vice-Premier of the Chinese Communist Party in Beijing. Yanji is also home to the Yanbian University of Science and Technology, a technical research college founded in 1990, and the Yanbian Medical College. Yanbian International Academy, the area school for foreigners, is located in Yanji. There is also a school for Koreans, Korean International School in Yanbian. Yanji hosts sporting events at the 50,000-seat People's Stadium. The city was the eighteenth stop for the Olympic torch relay at the opening of the 2008 Summer Games. Officials from the Guinness Book of World Records visited the athletics stadium at Yanbian University in July 2010 to witness a new world record being set: over one thousand students simultaneously juggled soccer balls with their feet for more than ten seconds. Although there is a degree of cultural synthesis, Yanji is more often described as more of a Korean, rather than a Chinese, community. Two all-Korean television channels are produced locally, and others can be freely received from both North and South Korea. Korean cuisine is highly popular and available everywhere. An annual Korean folk festival takes place each September in Yanji, featuring traditional Korean music, dance, painting, and sports. Karaoke is popular in Yanji,:35 and the city even has a burgeoning underground beatboxing scene, which has been documented by filmmaker Liu Feng in Yan Bian Box (2007). ^ a b c "China torch relay: Yanji". BBC News. 21 July 2008. Retrieved 22 November 2010. ^ "The Yanbian Korean Autonomous Prefecture". China.org.cn. 2003. Retrieved 21 November 2010. ^ a b c Harper, Damian (2007). China. Lonely Planet. p. 384. ISBN 1-74059-915-2. Retrieved 21 November 2010. ^ a b Guo, Rongxing; Freeman, Carla (2010). Managing Fragile Regions: Method and Application. Springer. p. 39. ISBN 1-4419-6435-5. Retrieved 25 November 2010. ^ Salmon, Andrew (15 December 2004). "Seoul charges suspect in North Korea kidnapping case". New York Times. Retrieved 25 November 2010. ^ Sang-Hun, Choe (19 March 2009). "North Korea Said to Detain 2 U.S. Journalists". New York Times. Retrieved 22 November 2010. ^ "North Korea Pardons US Reporters". BBC News. 4 August 2009. Retrieved 22 November 2010. ^ Stone Fish, Isaac (20 June 2011). "North Korea's Addicting Export: Crystal Meth". Pulitzer Center on Crisis Reporting. Retrieved 27 June 2011. ^ Stone Fish, Isaac (19 June 2011). "North Korea's Meth Export". Newsweek. Retrieved 27 June 2011. ^ a b c d Demick, Barbara. "Nothing Left: Is North Korea finally facing collapse?". The New Yorker. Condé Nast (12 & 19 July 2010): 44–49. Retrieved 22 November 2010. ^ a b Akaha, Tsuneo; Vassilieva, Anna (2005). Crossing National Borders: Human migration issues in Northeast Asia. United Nations University Press. p. 171. ISBN 92-808-1117-7. Retrieved 21 November 2010. ^ 中国地面国际交换站气候标准值月值数据集（1971－2000年） (in Chinese). China Meteorological Administration. Archived from the original on 16 October 2013. Retrieved 4 May 2010. ^ "延边朝鲜族自治州-行政区划网 www.xzqh.org" (in Chinese). xzqh.org. Retrieved 28 April 2011. ^ a b c Bergsten, C. Fred (2003). The Korean Diaspora in the World Economy. US: Peterson Institute. p. 106. ISBN 0-88132-358-6. Retrieved 22 November 2010. ^ Lankov, Andrei (16 August 2007). "The Gentle Decline of the 'Third Korea'". Asia Times Online. Retrieved 22 November 2010. ^ a b c d e f g h Evans, Thammy (2006). Great Wall of China: Beijing & Northern China. Bradt Travel Guides. p. 118. ISBN 1-84162-158-7. Retrieved 21 November 2010. ^ a b c Legerton, Colin; Rawson, Jacob (2009). Invisible China: A Journey Through Ethnic Borderlands. Chicago Review Press. p. 44. ISBN 1-55652-814-0. Retrieved 22 November 2010. ^ "Shanghai's permanent population approaches 20 mln". People's Daily Online. 20 February 2010. Retrieved 25 November 2010. ^ a b c Fung, Alan (4 October 2003). "A slice of Korea in China". Asia Times Online. Retrieved 25 November 2010. ^ a b Steven R., Weisman; Onishi, Norimitsu (16 October 2006). "Rice to Press China to Enforce North Korean Sanctions". New York Times. Retrieved 21 November 2010. ^ Montgomery, John D.; Inkeles, Alex (2001). Social Capital as a Policy Resource. Springer. p. 54. ISBN 0-7923-7273-5. Retrieved 21 November 2010. ^ a b Wu, Fulong (2006). Globalization and the Chinese City. Psychology Press. p. 35. ISBN 0-415-35199-5. Retrieved 22 November 2010. ^ "Yanji fair promotes northern tourism". China Daily. 22 July 2008. Retrieved 23 November 2010. ^ "Tumen River Area International Investment & Business Forum". China Daily. 2004. Retrieved 25 November 2010. ^ Liu Mingtai (22 October 2009). "Seven million vote in bid to find 'Top Eight' tourism sites". China Daily. Retrieved 21 November 2010. ^ "Safe water to drink is a major concern for Jilin". China Daily. 12 October 2006. Retrieved 25 November 2010. ^ Luc Citrinot (20 August 2012). "China-North Korea: the next Promised Land for tourism?". Travel Daily News. Retrieved 21 August 2012. ^ a b "Yanbian University: A Brief Introduction". Yanbian University. Retrieved 21 November 2010. ^ Xinhua (2008). "Zhang Dejiang, Chinese vice-premier". China Daily. Retrieved 25 November 2010. ^ "Politburo: Zhang Dejiang". China Daily. 2007. Retrieved 25 November 2010. ^ "Yanbian University of Science & Technology". YUST. 2005. Retrieved 21 November 2010. ^ International Association of Universities (2009). World List of Universities (18 ed.). University of Michigan (MacMillan). p. 96. ISBN 0-333-47488-0. Retrieved 22 November 2010. ^ "Where Are We?" (Archive). Yanbian International Academy. Retrieved on 1 October 2015. "Yanbian International Academy 2728B Chaoyang Street, Yanji City, Jilin Province China 133000[...]吉林省延吉市朝阳街2728B 外国人学校 中国 133000" - Google Maps has it listed as "Yanbian Waiguoren School"
^ "Stadiums in China". World Stadiums.com. 2007. Retrieved 21 November 2010. ^ "Torch Relay: Planned Route". Beijing2008.cn. Archived from the original on 23 December 2010. Retrieved 25 November 2010. ^ "Olympic torch relay in Yanji concludes". Beijing2008.cn. 2008. Retrieved 21 November 2010. ^ "World record ball-juggling made in China". China Daily. 11 July 2010. Retrieved 23 November 2010. ^ Foster, Simon; Lin-Liu, Jen (2010). Frommer's China. Frommer's. p. 207. ISBN 0-470-52658-0. Retrieved 25 November 2010. ^ "Party in his mouth". China Daily. 26 May 2007. Retrieved 23 November 2010. ^ "Yanbian Box". InvAsian. Retrieved 23 November 2010.